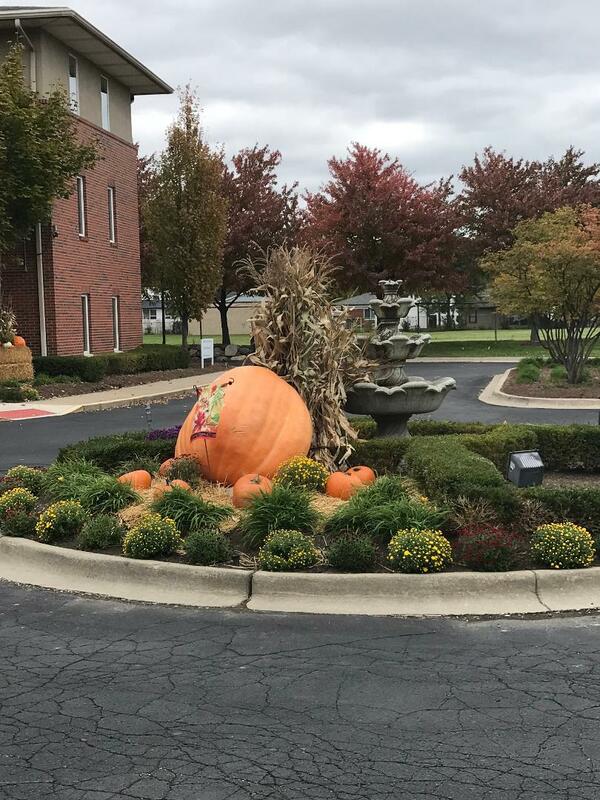 Below is a pumpkin my daughter-in-law, Sharon, and granddaughter, Brooke, carved a couple of Halloween's ago. It was their version of Olaf from the Disney movie, Frozen. Tonight will be their annual 'open garage' for trick or treaters. My hubby and son, Steve, began getting the garage ready yesterday and will finish up this afternoon. 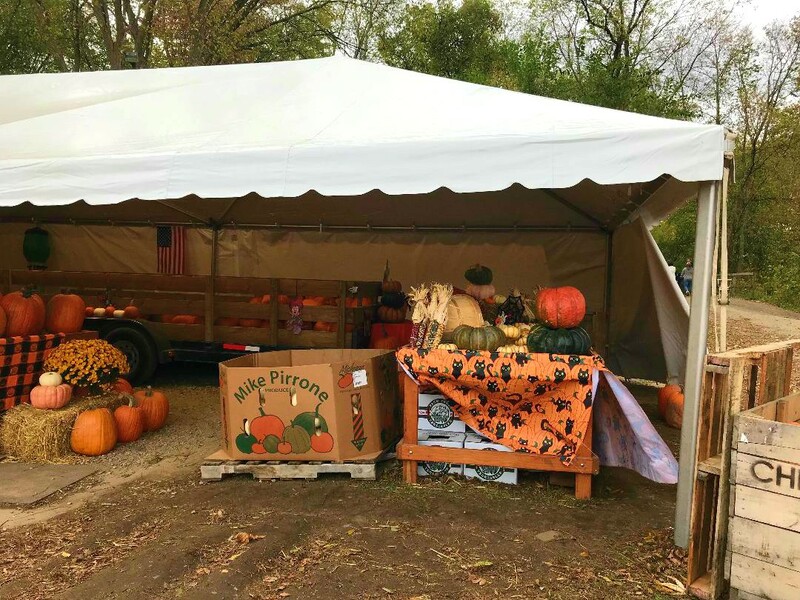 It's raining right now, but is supposed to clear in time for the ghosts and goblins tonight. 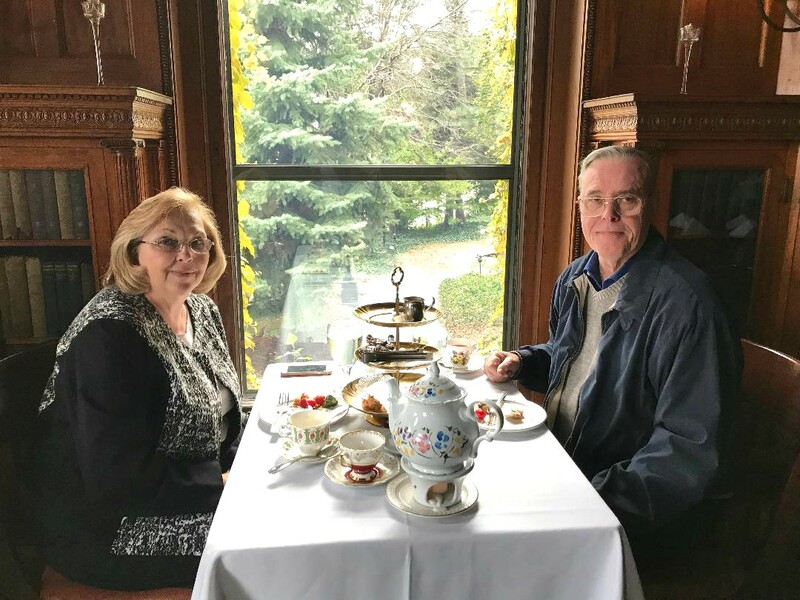 Yesterday my girlfriend, Sandy, and her husband, Terry, came to Afternoon Tea at The Whitney. An entire year had lapsed since we last saw each other, so it was good to get caught up a bit. Afternoon Tea was served in the Library yesterday. Last week tea was set up in Flora's sitting room on the second floor. The bedroom and sitting room is named in honor of David Whitney's first wife, but she passed away before the mansion was built, so in actuality it's Sarah Jane's [his second wife] bedroom and sitting room. The sitting room is lovely with a balcony that overlooks Woodward Avenue. I took some photos after it was set up for tea to share with you. 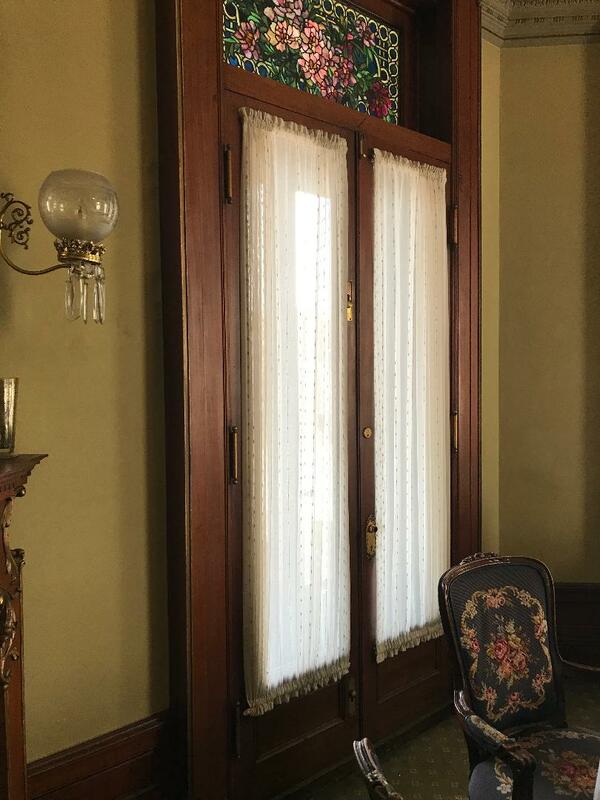 Below are the doors that overlook the balcony. The stained glass window above the doorway was made by Tiffany & Company in New York. 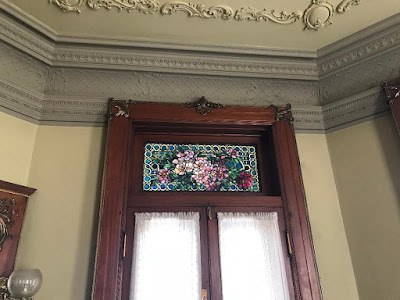 Notice the beautiful crown molding and scroll work on the ceiling. The balcony view with a high rise building and parking lot in the distance is much different from what Sarah would have seen. Woodward Avenue wasn't a paved thoroughfare in 1894. When Sarah walked out onto her balcony she might have seen an occasional horse and carriage going by but definitely no cars. 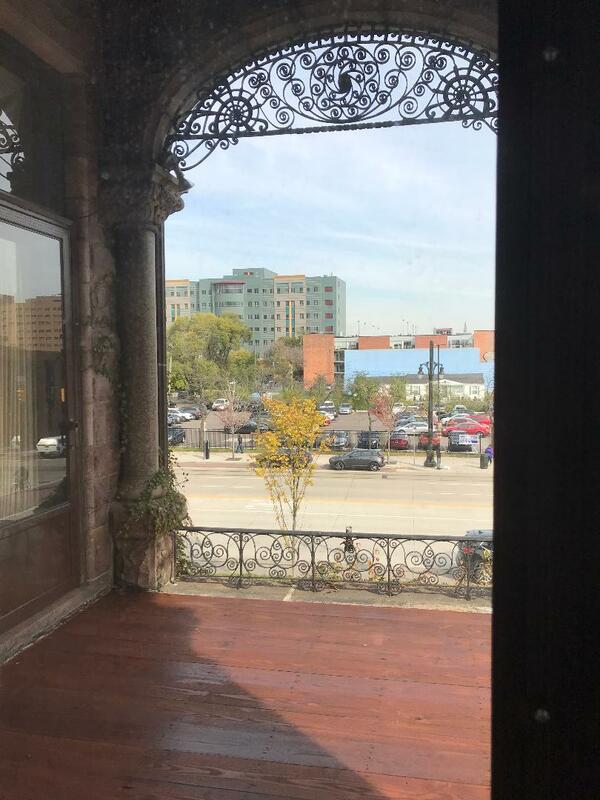 In 1909, Woodward Avenue was the first mile of concrete-paved roadway in the world, and in 1919, it's where the nation's first three-color traffic light was installed. Notice the trim on the closet door molding and inset panel. The two doorways exiting the sitting room leading out to the ballroom. Detailed craftsmanship like this is unheard of today. 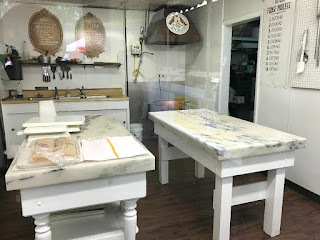 The craftsmen no longer exist. All set up for Afternoon Tea. 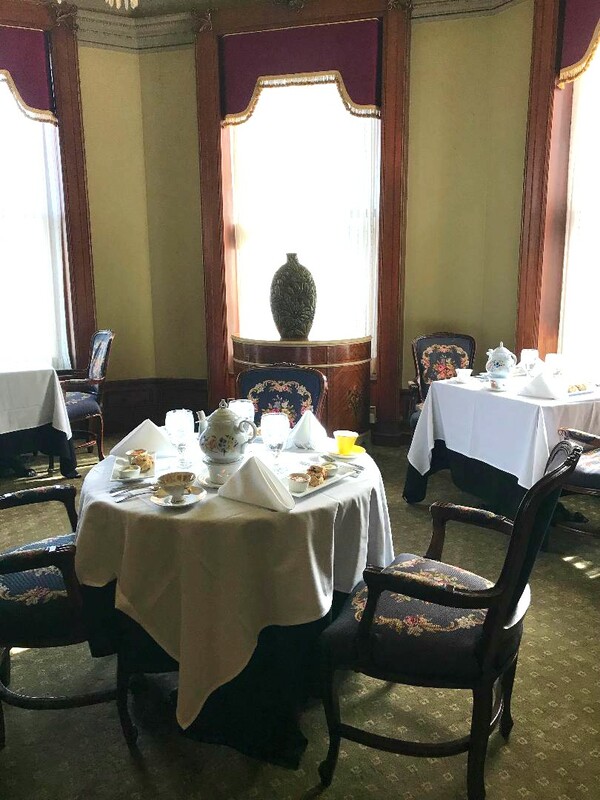 There's a commercial kitchen on each floor of the mansion to accommodate dining on all three floors. They're the areas that were previously allocated for servants quarters. My hubby drove out to Chelsea last Saturday for grandson Landon's last football game of the season. 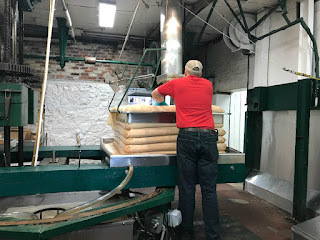 I stayed behind to get caught on some things at home. 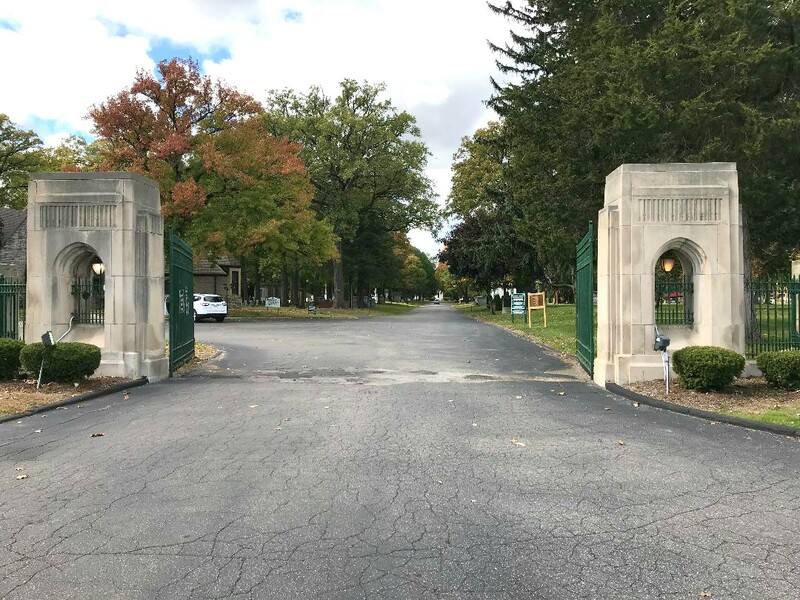 Woodmere cemetery is an old cemetery. 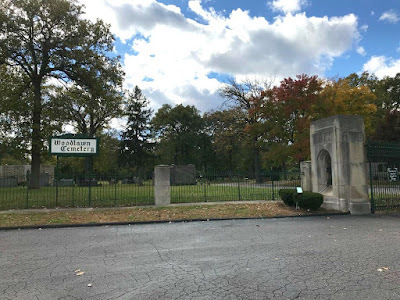 It was organized in 1867 [two years after the Civil War ended] by a group of prominent businessmen who purchased approximately 250 acres to establish a rural cemetery for the City of Detroit. [It's definitely not rural today!] Construction began in 1868 and the cemetery was dedicated in 1869. 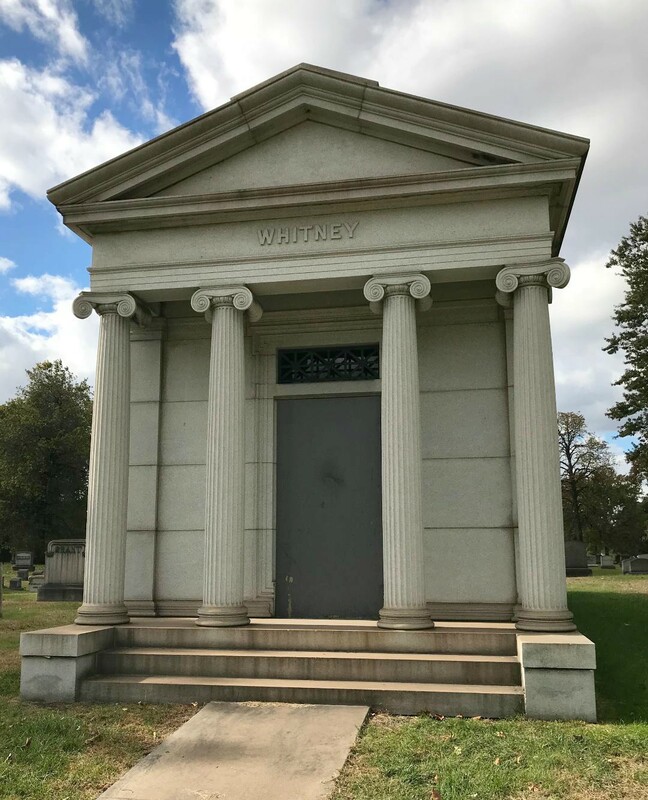 After checking in at the information office, two cemetery associates took us to section F where David Whitney, Jr.'s vault/mausoleum is located. 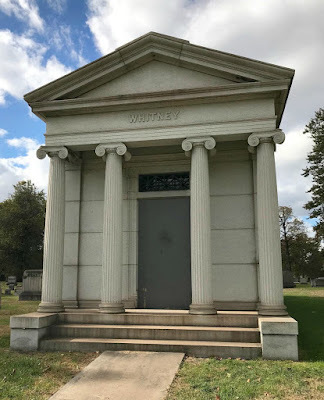 There are no exterior markings on the mausoleum to indicate how many members of the Whitney's family are buried inside, but the associate said there were several - some of whom were cremated. I was given the business card of a genealogist who works for the cemetery to contact for more detailed information. 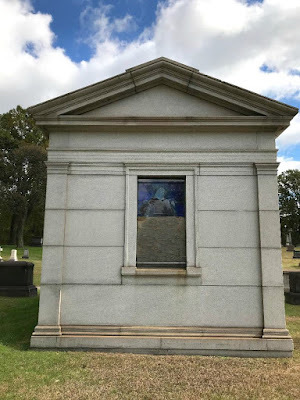 Back view of the mausoleum [below]. It appears the lower half of the stained glass window was broken out and covered with a piece of plywood. Right next to the mausoleum is Grace Whitney Hoff and her husband, John's, grave sight and monument. 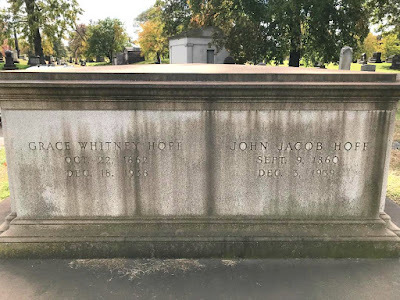 Grace is Mr. Whitney's first-born child. I was saddened to discover that in December 2012 many of the mausoleums were vandalized, and the bronze doors were removed and presumably sold for scrap. Mr. Whitney's mausoleum was one of them. 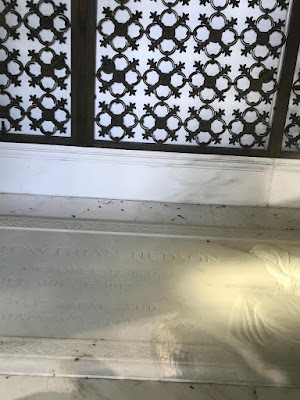 If you look at the photos I took today, the door to the mausoleum is covered with a large piece of plywood painted gray. 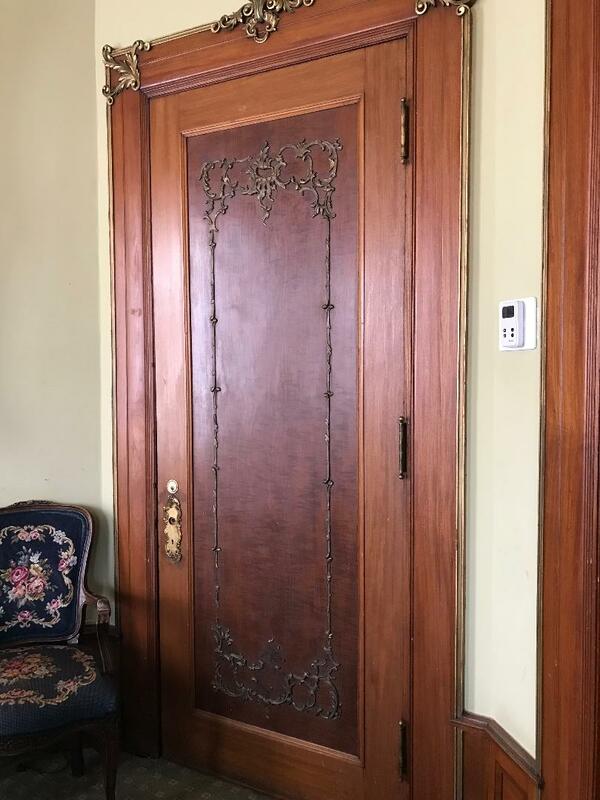 Below is an Internet photo where the bronze doors are still intact. The overgrown shrubbery has all been removed. 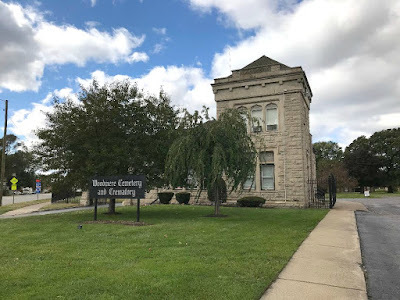 From Woodmere Cemetery, we drove over to Woodlawn Cemetery where Mr. Whitney's youngest daughter, Katherine Whitney McGregor, is buried along with her husband, Tracy. Woodmere Cemetery sits on 140 acres and is located at Woodward and Eight Mile Road. It was established in 1895, and attracted some of the most notable names in the City of Detroit. 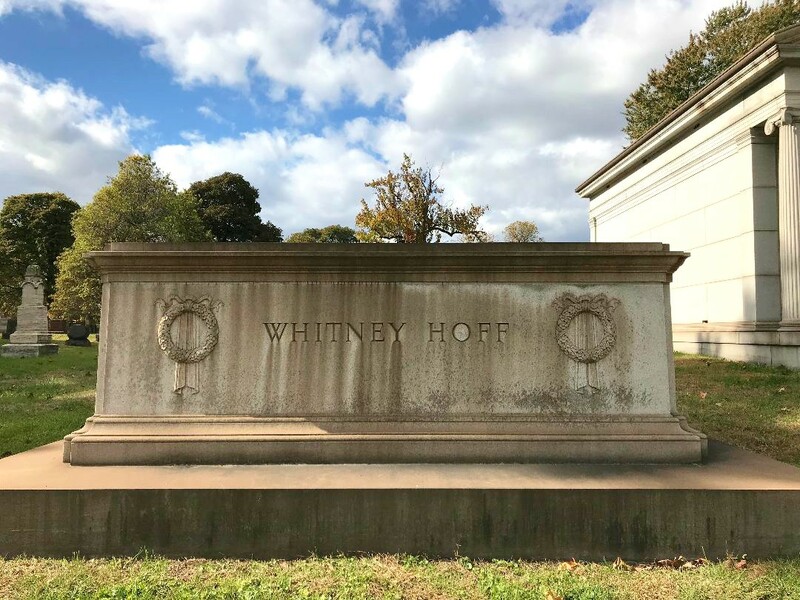 The reason Mr. Whitney isn't buried there is most likely because his first wife, Flora, died in 1882 before Woodlawn Cemetery was established. 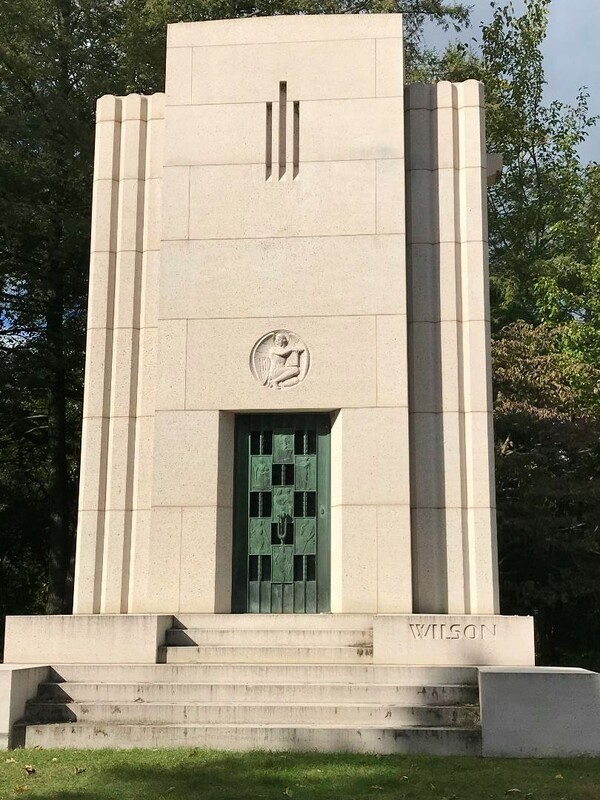 Flora is probably the first member of the Whitney family to be entombed in the mausoleum. We stopped at the information office to see where the McGregor plots were located, and were told they were in section 10. Also in section 10 was J.L. Hudson's mausoleum [founder of Hudson's department store]. 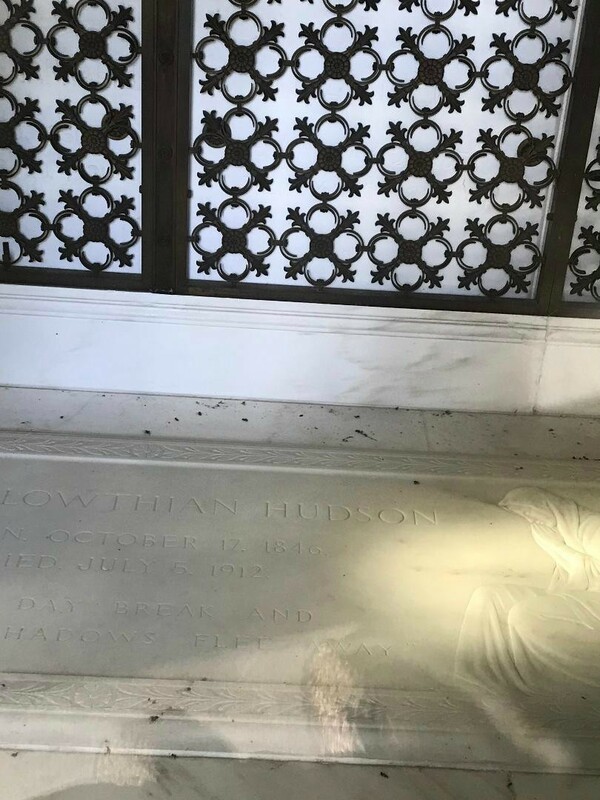 Mr. Hudson was a pallbearer at Mr. Whitney's funeral. 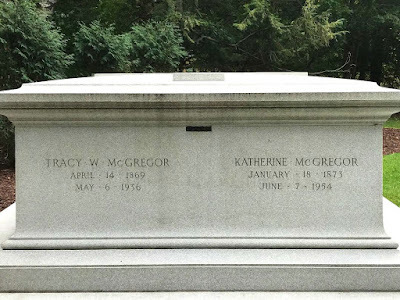 I couldn't resist taking a photo of his mausoleum, since I've done a lot of research on him too. 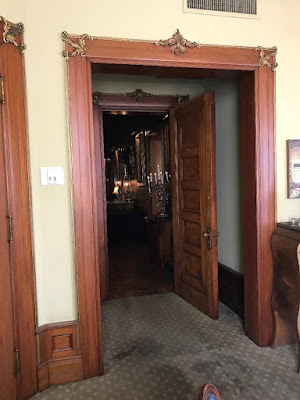 I peeked inside the bronze doors and could see his memorial on the floor. On the back wall were the names of other family members entombed, but not visible in my photo. 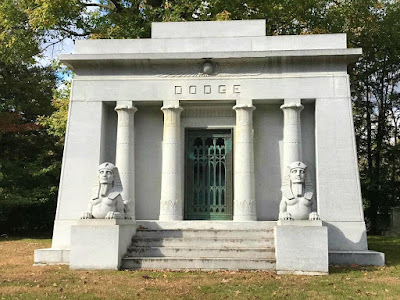 Close to Mr. Hudson's mausoleum was the Dodge mausoleum. John and Horace Dodge were founders of the automobile firm, Dodge Brothers Company. Ironically, John Dodge and J.L. 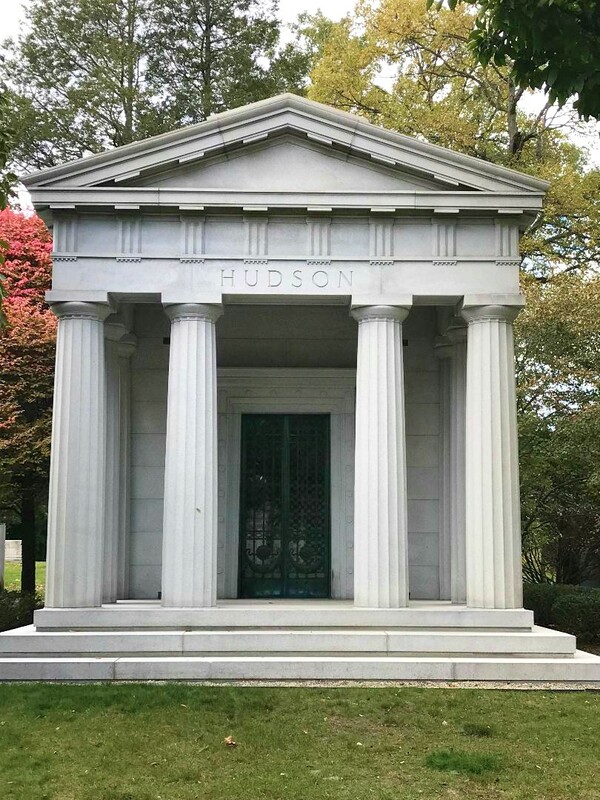 Hudson were neighbors while they were alive on East Boston Blvd. 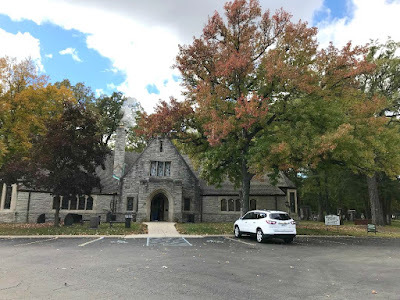 in Detroit, and they're neighbors in the cemetery too! 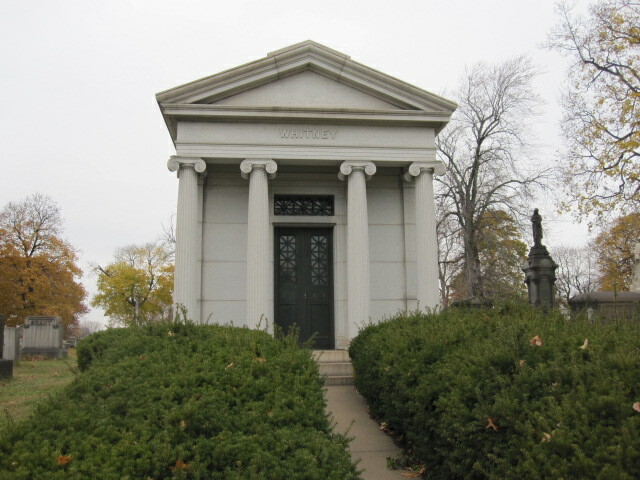 Right next to the Dodge mausoleum was Matilda Dodge Wilson's mausoleum. Matilda was married to John Dodge at the time of his death and they had three children. 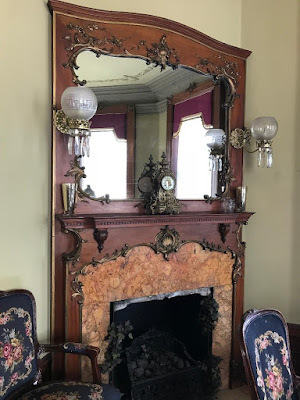 She later married Alfred Wilson and together they built Meadow Brook Hall. Finally we came to Tracy and Katherine McGregor's tomb. Edsel and Eleanor Ford and their children are buried at Woodlawn Cemetery as well as Diana Ross' parents and most recently, Aretha Franklin. Two cemeteries in one day was quite enough, so we headed back home. As we rode home I pondered that it doesn't matter how rich or prominent a person is, it's appointed unto man [and woman] a time to die [except for those who are alive when the rapture takes place]. If the individuals entombed in mausoleums or beneath cement monuments had a personal relationship with Christ, when He returns their bodies will burst forth to be reunited with their souls in Heaven for eternity. The Bible says in I Thessalonians 4:14-17: "For if we believe that Jesus died and rose again, even so God will bring with Him those who sleep in Jesus... For the Lord Himself will descend from Heaven with a shout, with the voice of an archangel, and with the trumpet of God. And the dead in Christ will rise first. Then we who are alive and remain shall be caught up together with them in the clouds to meet the Lord in the air. And thus we shall always be with the Lord." What a promise! 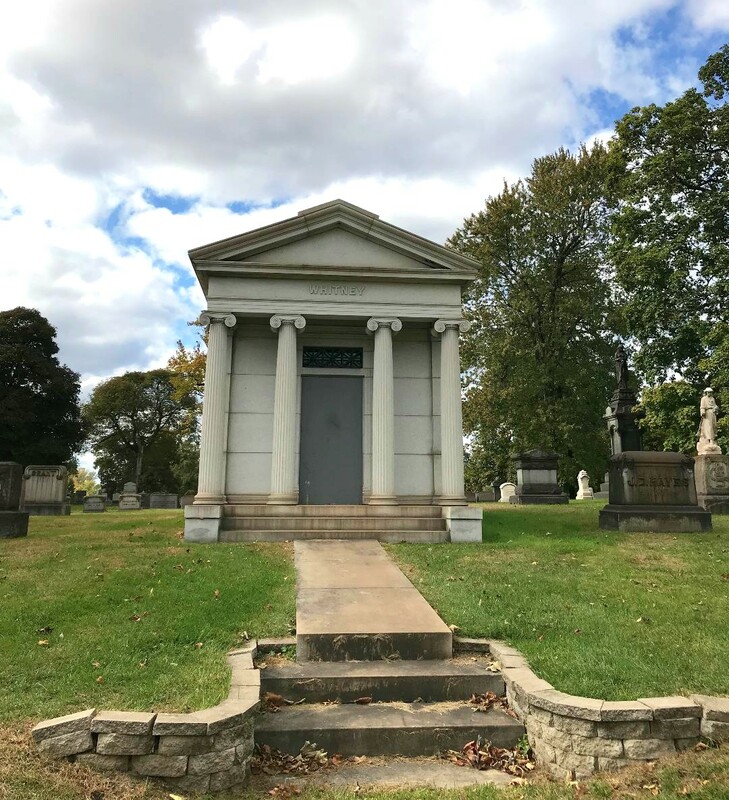 Can't you just imagine what it will be like when all the bodies of the "redeemed in Christ" break their tombs wide open and ascend through the clouds to their eternal home with the Lord? The words the Apostle Paul wrote in I Corinthians chapter 15: 54-57 bring such comfort: "Death has been swallowed up in victory. 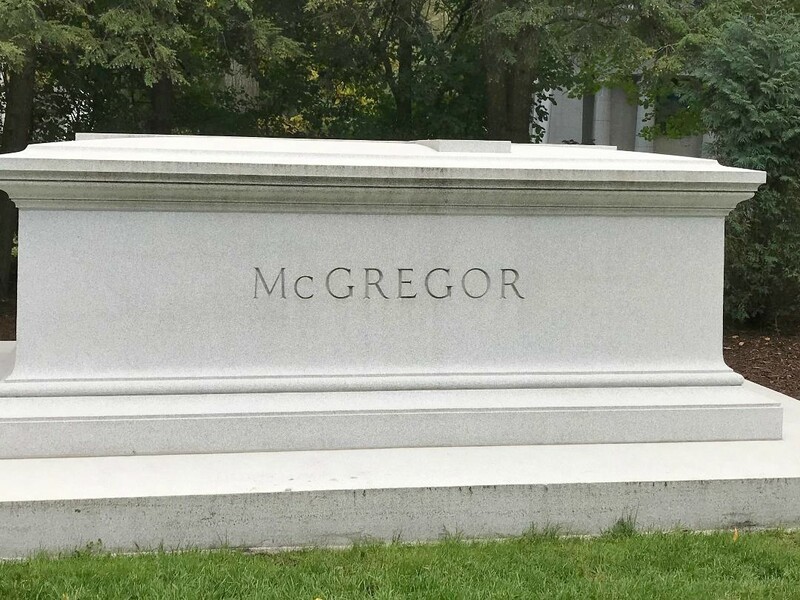 Where, O death is your victory? Where O death is your sting?... Thanks be to God! He gives us the victory through our Lord Jesus Christ." 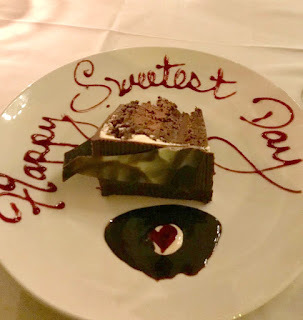 As you know, Saturday was Sweetest Day, so earlier in the week I made reservations to take my Sweetie to The Whitney for a tour of the mansion and dinner afterwards. The weather on Saturday in southeastern Michigan was anything but desirable. The rival Michigan / Michigan State football game had to be delayed due to rain and high winds, and temps never got above 50 degrees. 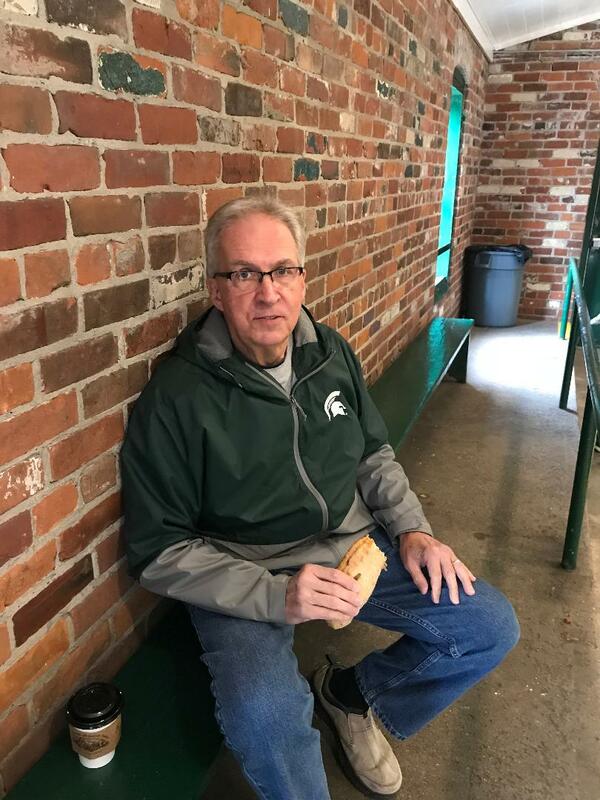 Unfortunately, the team my family was rooting for [Michigan State] lost. My hubby and I left home around 5:00 p.m. for The Whitney. We enjoyed the tour of the mansion and then were seated in the Reception Room for dinner. 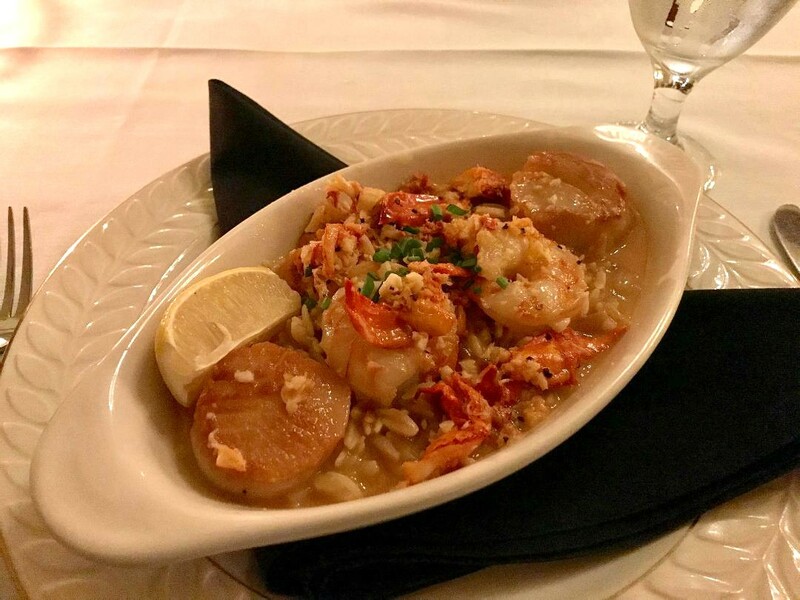 Jerry and I both ordered the same thing - Mansion Specialty, Seafood Sauté: Shrimp, Scallops, and Main Lobster with fresh herbs, chardonnay, and sweet butter served over toasted orzo. It was delicious! Initially my taste buds were set on their signature Beef Wellington, but I'm trying to correct a health issue so I decided to go with seafood instead of red meat. 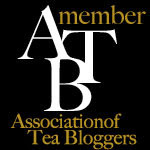 Since it was past the time for drinking tea [so caffeine wouldn't interrupt a good night's sleep], I ordered African Nectar: Rooibos with Vanilla, Mango and Hibiscus Blossoms to go with my meal. It was blended by Mighty Leaf and was very good. 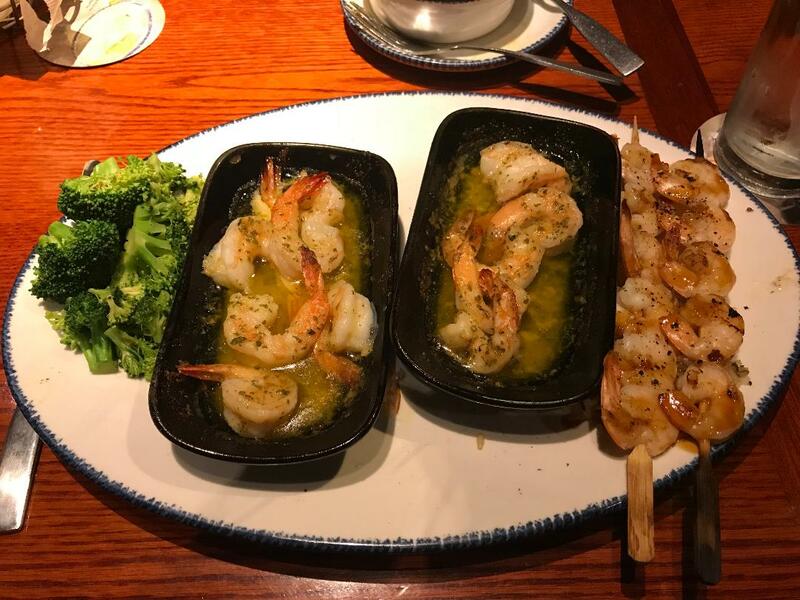 Josh, our server, took our picture. He gave me permission to take his picture and post it. 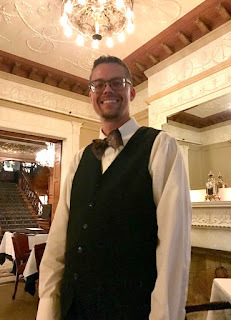 Josh is also a server for Afternoon Tea, and he served the tea meal my first day on the job as Tea Director. 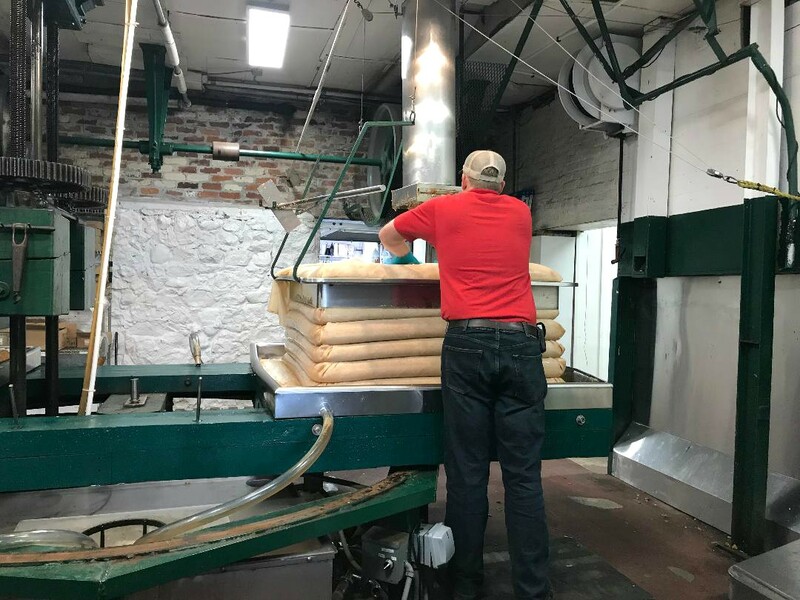 He was [and is] very kind and helpful. I didn't order dessert but Jerry got a decadent, flourless chocolate cake that he thoroughly enjoyed. 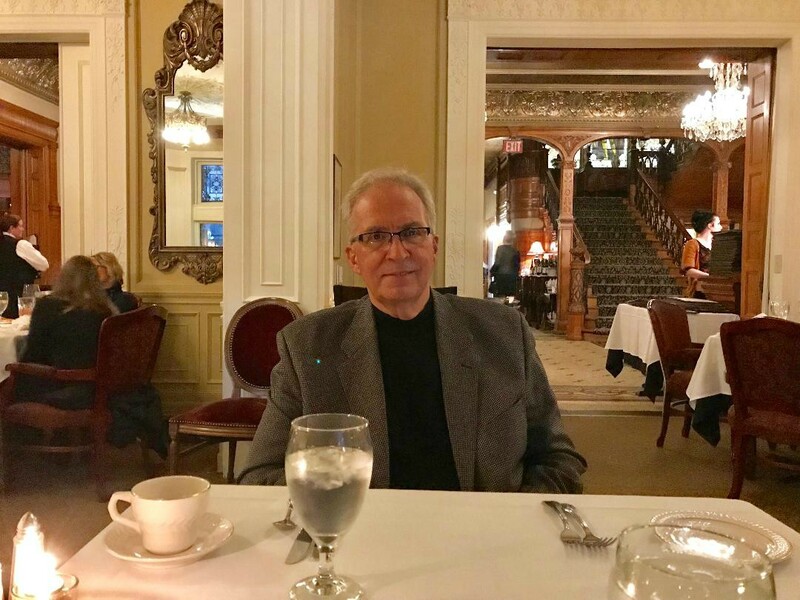 When we left the restaurant, the temps had dropped into the low 30's and there was a light dusting of snow on the ground and parked cars. Seriously?! I'm not ready for snow in October, and was glad when it melted quickly. 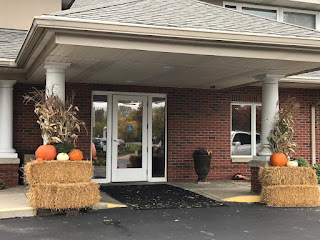 Sunday was my presentation at Shore Pointe Assisted Living during their monthly tea. 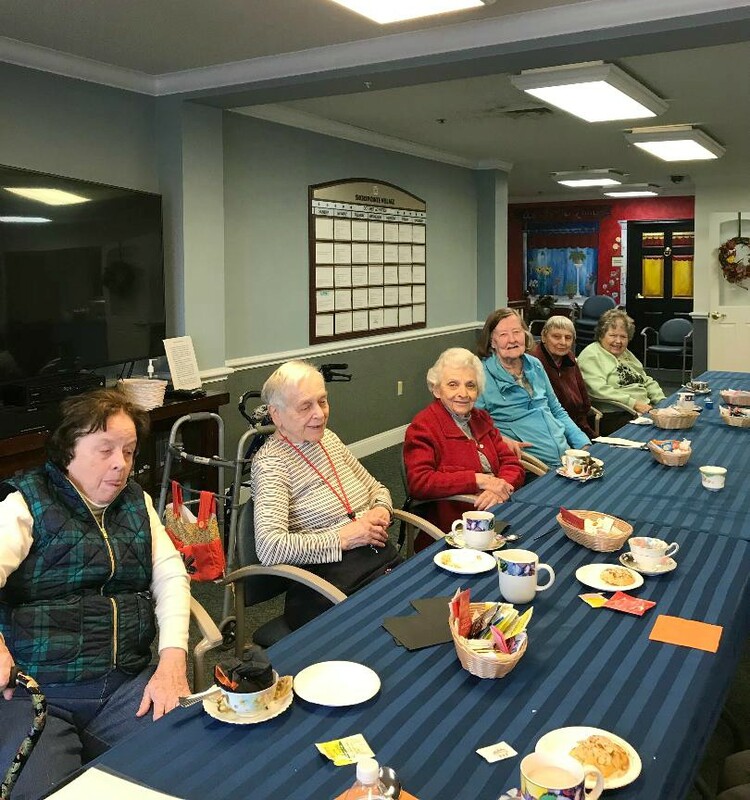 13 residents attended along with two staff members. Inside and outside were festively decorated for fall. 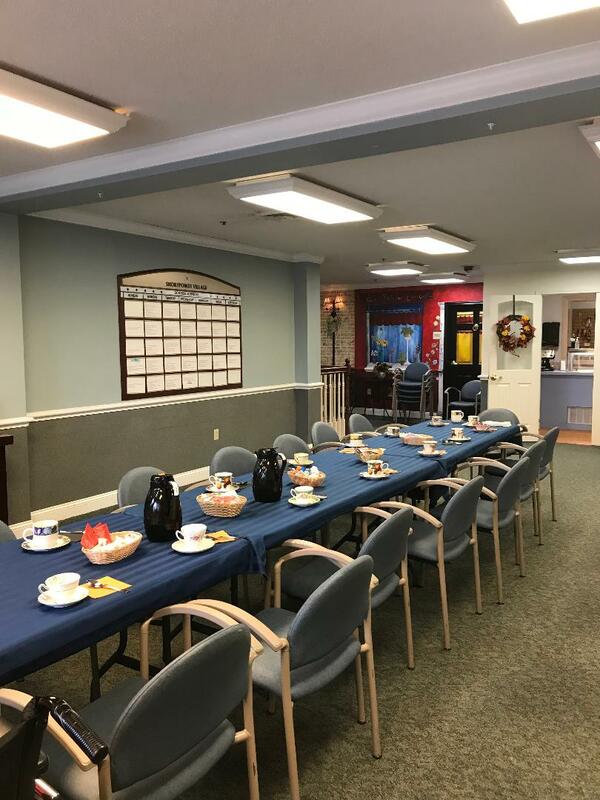 The table was all set up and waiting for the residents when I arrived. My theme was Special Bears Throughout Time. I began with how the teddy bear came to be in the United States in honor of our 26th President, Theodore [Teddy] Roosevelt, and his bear hunt in Mississippi in 1902. It was fun recalling several bears: Winnie the Pooh; Paddington; Corduroy; Smokey the Bear [the longest-running public service advertising campaign in U.S. history]; Care Bears; Santa Bears; Yogi Bear; and more. I included well-known companies that manufactured stuffed bears, and one of the residents commented that early teddy bears weren't nearly as 'cuddly' and soft as today's teddy bears. 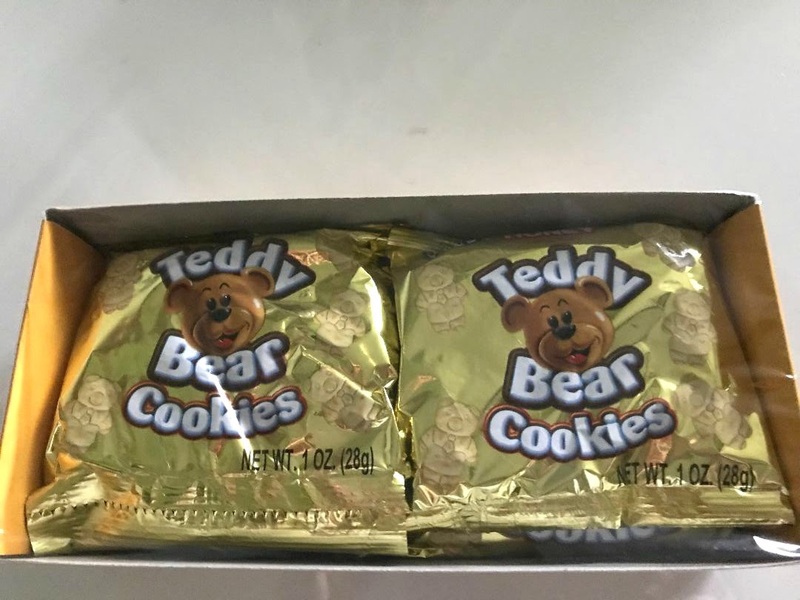 That's because they were stuffed with excelsior packing materials which made them very stiff. 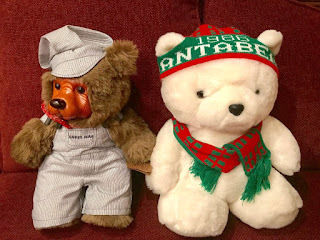 I took a 1986 Dayton-Hudson's Santa Bear [the first one came out in 1985], and my Raikes Lionel Railroad Bear with carved wooden face and paws. I also took a Boyd's Bear figurine and a Cherished Teddy figurine [both tea themed]. 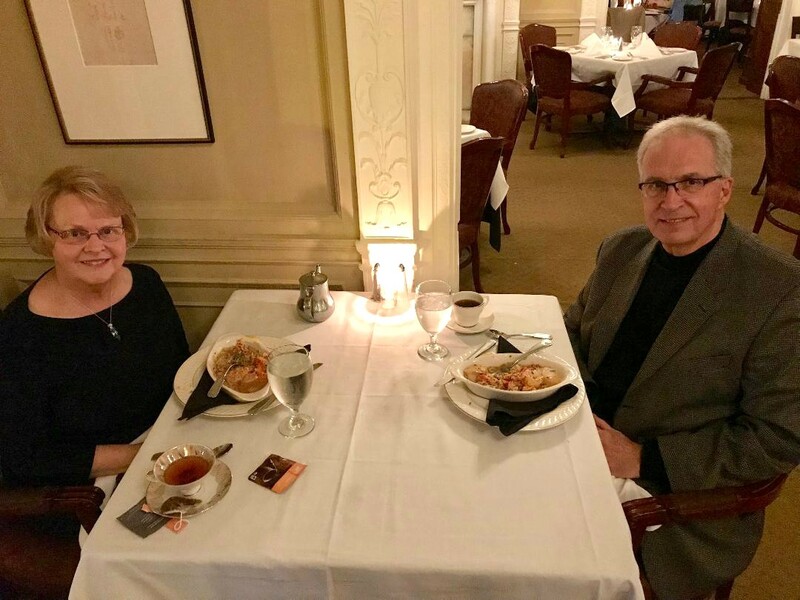 We talked about the 19th-century fairy tale, Goldilocks and the Three Bears written in 1837, and even included Elvis Presley's hit song [Let Me be Your] Teddy Bear in 1957. It was a fun walk down memory lane for the residents. 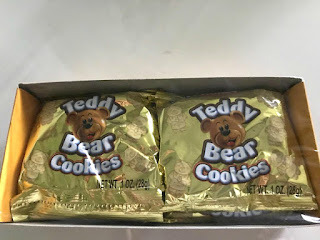 I gave them each a bag of Honey Teddy Bear Cookies as their treat. The aides had already started clearing the table, and some of the residents had left to go back to their rooms when I remembered I hadn't taken their picture. I took it anyway with the residents who remained. By the time I got home it was 4:00 o'clock and our annual church Harvest Fest had already begun. 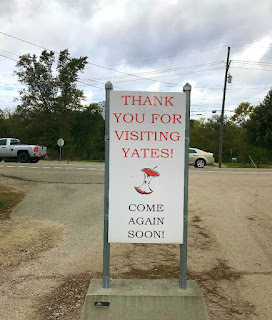 I didn't have the energy to change into warm outdoor clothing and drive out to the property, but my hubby said it was the largest attendance we've had to date. 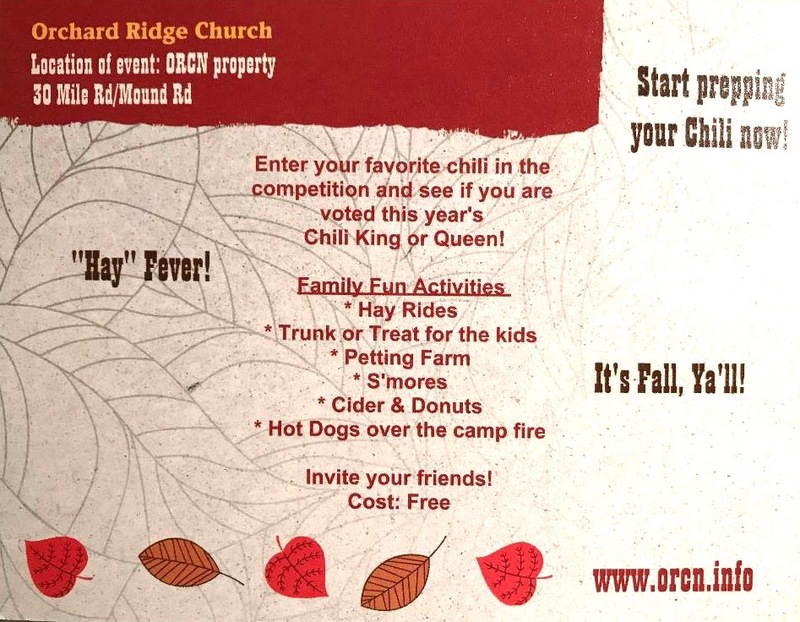 I only have one picture of the bonfire to post, but I know lots of photos were taken of the hayride, trunk or treat, and chili-cook off contest. It was a fun weekend! 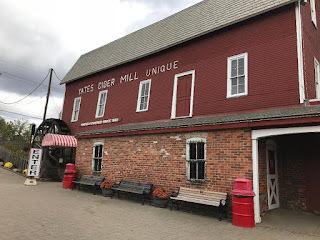 I had a day off today because there were no reservations for Afternoon Tea, so my hubby and I decided to make our annual fall visit to the cider mill. For me, fall and cider mills go hand in hand. 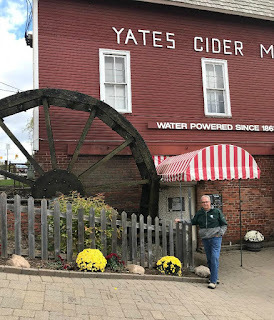 Today was brisk [50 degrees] with overcast skies in southeastern MI, but good cider mill weather. Yates Cider Mill has been operating since 1876, and is a Michigan Historic Site. 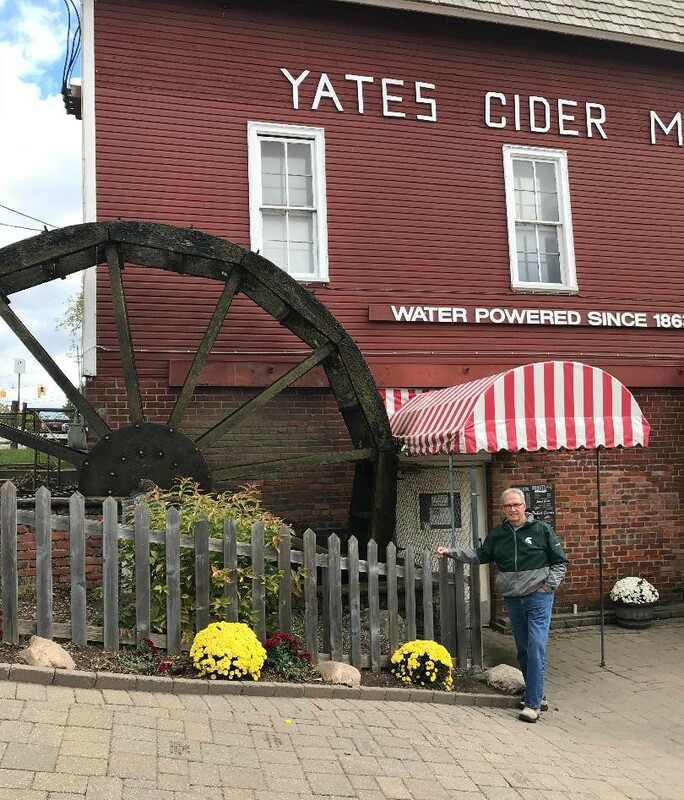 Michigan has over 100 cider mills and several of them are a short driving distance from where I live. 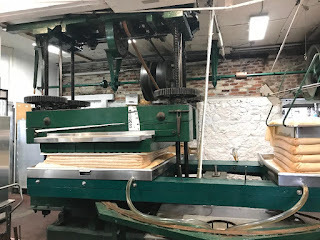 We saw the apples being pressed to make apple cider. 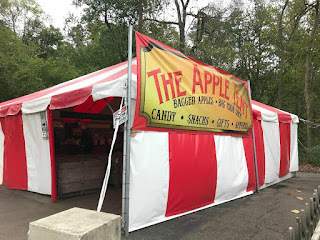 We bought a gallon of cider, and Jerry got an freshly baked apple hand pie. 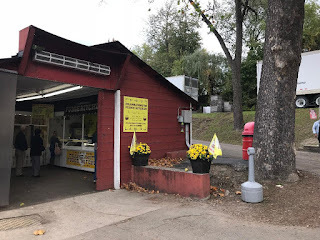 I enjoyed a cup of cider, while Jerry thought coffee would go better with his hand pie. The grounds were beautifully decorated with fall arrangements and mums. but they weren't making it while we were there. 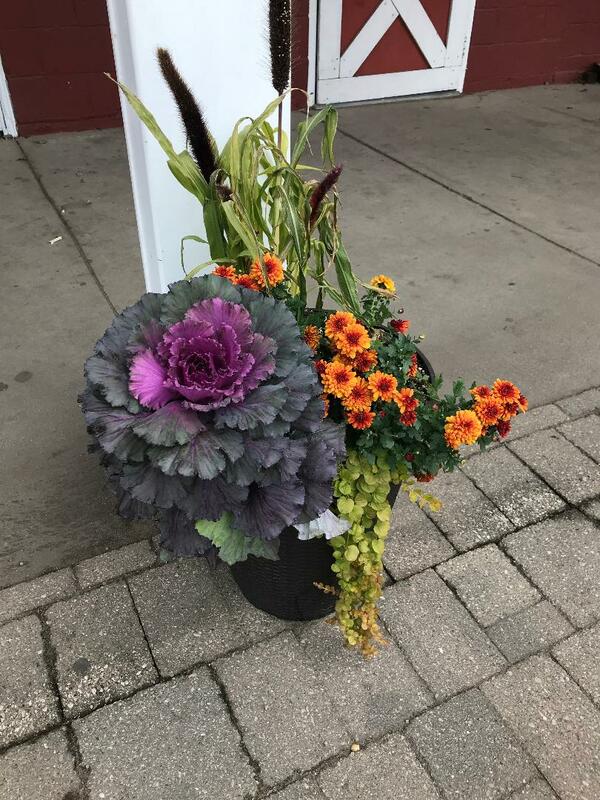 Jerry took advantage of their special - buy two pieces and get the third free. 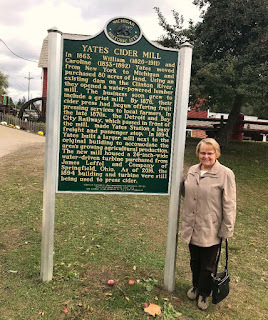 Our youngest son, Jeremy, and his family visited an apple orchard last Sunday. 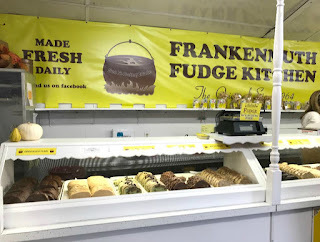 It's an annual tradition with our daughter-in-law's family. 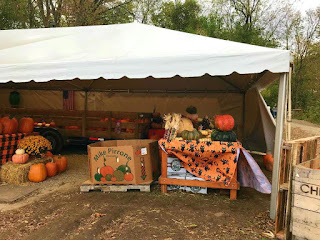 Have you done any fall activities? 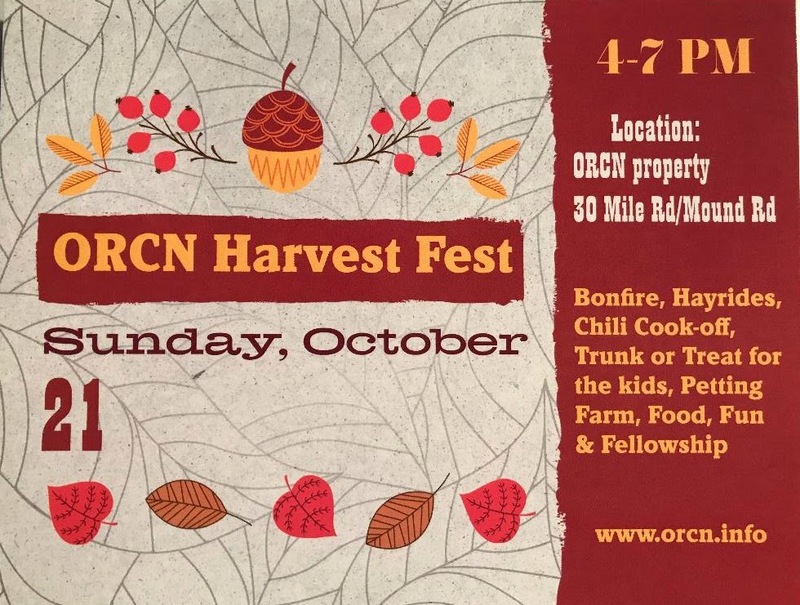 Our church [Orchard Ridge Church of the Nazarene] is hosting its annual Harvest Fest this coming Sunday on our property at 30 Mile and Mound Road in Washington Township. 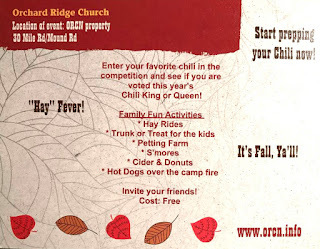 The flier below shows all the activities. It's open to all if you live in the area.